The Sonesta Resort Hilton Head Island reopened in May 2013 after the completion of a $30-million renovation that touched on every aspect of the property. The result is a light, airy and bright hotel that reflects the relaxed attitude and atmosphere of a beach vacation. Luxurious seating groups are found throughout, from the lobby to the cabanas by the pool and the landscaped ponds on the property. In addition, the staff is welcoming and friendly to children, which makes for a wonderful visit for parents and kids. Located on Shipyard Plantation on Hilton Head Island, the Sonesta Resort Hilton Head Island sits behind the sand dunes of the beach, overlooking the Atlantic Ocean, so it’s not directly on the beach, contrary to what one may think of with many “beachfront” properties. Due to the lush landscaping, there’s also not much of a beach or ocean view, but the grounds are so beautiful it doesn’t really matter, especially if you’re not one to spend a lot of time in your room or on your balcony. Hilton Head Island is a wonderful family vacation destination, and staying at the Sonesta Resort Hilton Head Island is a great way to take advantage of all the area has to offer. For more information, read about Sonesta Hotels and Resorts. The Sonesta Resort Hilton Head Island features 340 rooms, including nine suites. Regular guestrooms come with either two queen beds or one king in 450 square feet. 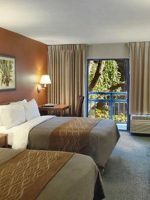 The King Executive guestroom stretches up to 500 square feet, with the Hospitality Suite reaching 900 square feet and the Garden Suite measuring 950 square feet. The hotel's largest suite, the Presidential Suite, encompasses 1,200 square feet. In the regular guestrooms, there is quite a bit of storage space thanks to the cabinets along one wall, plus the closet. The bathroom is spacious, with storage shelves under the counter. Each room also includes a sitting chair and ottoman, along with a desk chair. In addition, there is a coffeemaker and small refrigerator, which allows families to store snacks and drinks in the room. Most rooms feature a small balcony with two chairs and a small table, and with either a view of the hotel's lush landscape or the parking lot. If view is important to you, be specific when booking your room. On the first level, there also are some rooms that open onto patios instead of balconies, some even heading out to the pool area. A unique feature in the guestrooms is the motion lights. There are a series of motion-detected lights along the baseboards at the head of the beds that come on in the dark as someone walks past. This is great for midnight trips to the bathroom so that those sleeping are not disturbed. Our first trip to Hilton Head and the Hilton Head Sonestra! What a beautiful place, amazing resort and location. From the Hotel, to the pool area to the ocean front we couldn't have asked for a more peaceful and relaxing vacation spot. The entire staff made us feel welcome. Looking forward to returning soon! Stayed for 5 nights last week. Had an amazing stay. Room was beautiful and clean. Was greeted by a manager upon my arrival which made me feel very welcomed. Food, service, cleanliness were all wonderful. I would gladly recommend this hotel to anyone going to Hilton Head. An obvious draw for families, the beach is easily accessible just beyond the Sonesta Resort Hilton Head Island's grounds. There are two boardwalks that take guests out to the sand. When approaching the beach, the left boardwalk will pass the closest restrooms to the beach. There's also a wash station to rinse off sand. For those who don't want to carry their own beach gear with them, a third-party vendor does rent chairs and umbrellas. If you are bringing your own beach gear, note that it takes approximately 10 to 15 minutes to get from your room to the beach, so make sure you have everything you need to avoid repeat trips to and from the hotel. If you prefer the pool to the beach, the Sonesta Resort Hilton Head Island offers two pools for guests. The main pool is a sun-drenched pool featuring a beach entry that opens up into a much wider and deeper pool. At the beach entry, there are fountains that the little ones will love to play and splash in. The beach entry goes up to 2 feet deep, at which point there are steps down into the next area, which starts at 3 feet deep. This middle section of the pool ranges between 3 and 4 feet deep, and is perhaps the largest section of the main pool. The third section is the deep end, ranging from 4 feet 6 inches deep, to 8 feet deep. It is ideal for accomplished swimmers. For the most part, the main pool is in full sun, with the exception of the beach entry end, which is shaded by tall trees. If you want the kids out of the sun for a while, move over to the shade pool, a smaller, rectangle pool under cover of the adjacent building. This pool ranges from 3 feet 6 inches, to 6 feet 6 inches deep. The hot tub is also in this area. In all pool areas, there are plenty of lounge chairs, some accompanied by tables and umbrellas, as well as some shaded cabanas. All are available on a first-come, first-serve basis. As posted at the entry of the pool areas, no outside food or beverage is permitted. Instead, guests can order food from the Sweet Cane Bar & Grill, which is right next to the deep end of the main pool. There isn't much in the way of kid-friendly fare though, so we saw that many guests still brought in their own drinks and snacks. Bathrooms are convenient to the shade pool and near the main pool, although it's still a short walk when kids really need to go. In addition, you must bring your room key with you to obtain access to the building with the bathrooms, as well as return access to the pool area. The hotel also provides towels for the pool and beach at the Just Us Kids desk; just make sure to return them to the desk rather than take them back to your room. Also at the Just Us Kids desk, guests can buy beach and pool toys, as well as sunscreen and other "fun in the sun" necessities. Throughout the day, the Just Us Kids staff hosts a variety of activities for all age ranges. For instance, every day the staff hosts Hatchlings Hour, which is story time for children 3 and younger, as well as Turtle Feeding, where all guests can gather to feed the turtles in the property's pond. Some activities, such as arts and crafts, do require a minimal fee; check the current resort calendar for the most up-to-date activities, times and fees. For a more structured program, the Sonesta Resort Hilton Head Island offers the Just Us Kids Activities Program for guests ages 3 to 12. Itineraries include pool and/or beach time, arts and crafts, games, treasure hunts and more, usually revolving around a central theme. Kids ages 3 to 5 can participate in half-day sessions (9 a.m. to 1 p.m.; 1 p.m. to 5 p.m.), while children ages 6 to 12 can opt for full-day sessions (9 a.m. to 6 p.m.). All sessions include lunch and/or a snack according to time of day, and all participants receive a complimentary Just Us Kids T-shirt. Pre-registration is required at least 24 hours in advance for all kids programs. In addition, all children must be potty trained; diapers and training pants are not allowed. Discounts are available for multiple siblings, as well as for multiple-day passes. Drop-off service is also available between the hours of 8 a.m. and 6 p.m. for an hourly fee per child. Just Us Kids also offers a Kids Nite Out option every Wednesday, Friday and Saturday from 5 p.m. to 9:30 p.m. Kids will have fun swimming, playing games and watching a movie, with dinner included. Again, a discount is available for each additional sibling. Another fun activity to do is bike around the resort and Hilton Head Island. Rental bikes for all ages are available at the Just Us Kids desk, or you can bring your own. From the Sonesta Resort Hilton Head Island, there are paved bike paths throughout Shipyard Plantation, where the resort is located. Guests can ride up to the ponds near the entrance of Shipyard Plantation and check out the wildlife, which includes alligators, herons, turtles, fish and more. There are many more miles of paved bike trails throughout Hilton Head Island. Of course, Hilton Head Island offers many more family-friendly activities, such as dolphin-watching tours, free concerts, water sports and others. For more information, check out the Hilton Head Island-Bluffton Chamber of Commerce & Visitor and Convention Bureau Web site. 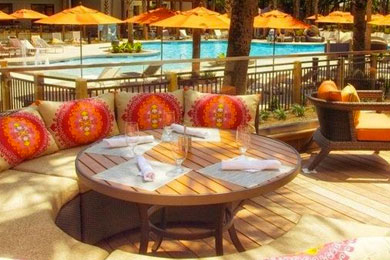 At the Sonesta Resort Hilton Head Island, guests will find three onsite restaurants: Heyward's Restaurant, Seacrest Terrace and Patio, and Sweet Cane Bar & Grille. Heyward's serves breakfast and dinner, along with a weekend breakfast buffet, Friday night seafood buffet, Saturday night prime rib and seafood buffet, and Sunday brunch. It has a good kid's menu for breakfast that includes eggs, pancakes, waffles and cereal, plus sides like fruit, yogurt and breakfast meats. Milk and juices are also available. Seacrest offers up lunch and small plates for dinner. Plus, you can order off the Heyward's dinner menu if you prefer. Both restaurants offer the same kid's menu for lunch and dinner, which includes standard options like pasta or chicken fingers and French fries, as well as appetizers, such as veggies and dip. At Sweet Cane Bar & Grille, your choices range from chicken quesadillas and crab cake sliders to salads and burgers. Note: Sweet Cane Bar & Grille is open seasonally and does close during the off-season. Although the food is good at each restaurant, getting food to the table takes longer than expected. Hotel management says these kinks are still being worked out, but for now, be prepared to wait. Also, beware there are no restrooms in the restaurants. You have to go back to the front of the hotel lobby to reach the nearest restrooms. For families who like to dine in their guestrooms, the hotel offers room service from 6 a.m. to 10 p.m. The hotel charges a $16 resort fee per day. This fee covers such services as self-parking for one vehicle per room, unlimited island-wide local calls, basic high-speed wired and wireless Internet for up to three devices per room, 24-hour access to the Tech Lounge (equipped with two computers and printers) and transportation to and from Shipyard Golf Course. The staff at the Sonesta Resort Hilton Head Island is very friendly to children throughout the property. They are always greeting and talking with kids. In addition, the front desk staff like to hand out special treats, like T-shirts or hats. Please note this is random and no one guest is singled out. Kids will also like the chocolates left behind during turndown service. When planning your visit, consider September or October, when the area experiences mild temperatures but is still warm enough for the beach and the hotel's heated pool. January is usually the least crowded time at the Sonesta Resort Hilton Head Island, with July being the most crowded time to visit. Guests can check the hotel website for value seasons; special packages and deals are also promoted on the hotel's Web site, Facebook page and via email to all Travel Pass members. Travel Pass is the hotel's loyalty program, which is free to join. Sonesta Resort Hilton Head Island is served by two airports. About 48 miles away, Savannah/Hilton Head International Airport (SAV) is served by most major airlines. Located 7 miles away on the island, Hilton Head Airport (HHH) welcomes commuter air service from US Airways. Charleston International Airport (CHS) is a two-hour drive north, while Jacksonville International Airport (JAX) is two and a half hours to the south. The resort is also easily accessible from Interstate 95. While the children are taking part in Just Us Kids, mom and dad will love relaxing for a bit in one of the private cabanas or hammocks scattered around the Sonesta Resort Hilton Head Island's property, followed by a bit of pampering in the Arum Spa. In the evening, the parents can enjoy a pre-dinner drink in Bayley's Bar and Terrace, the hotel's lobby bar, before heading to Heyward's for dinner on the terrace. Afterward, they can take in a moonlit walk along the beach.